Prose literacy – the knowledge and skills needed to understand and use information from texts including editorials, news stories, brochures and instruction manuals. http://www.statcan.gc.ca/pub/89-617-x/89-617-x2005001-eng.pdf – accessed July 15, 2017. Document literacy – the knowledge and skills required to locate and use information contained in various formats, including job applications, payroll forms, transportation schedules, maps, tables and charts. Numeracy – the knowledge and skills required to effectively manage the mathematical demands of diverse situations. Problem solving – problem solving involves goal-directed thinking and action in situations for which no routine solutions exist. The problem solver has a more or less well defined goal, but it is not immediately obvious how to reach it. The incongruence of goals and admissible operators constitutes a problem. The understanding of the problem situation and its step-by-step transformation, based on planning and reasoning, constitute the process of problem solving. 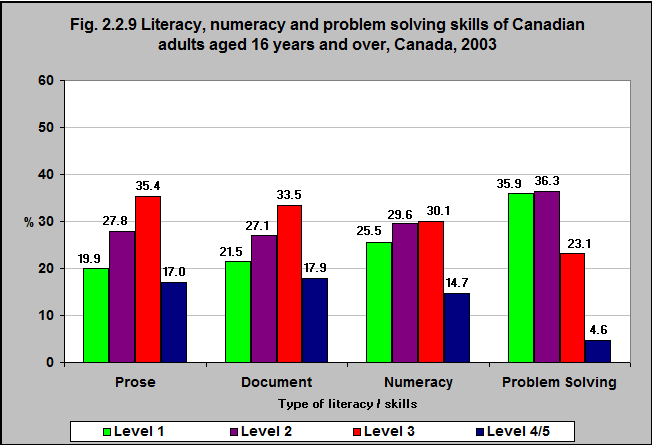 The International Adult Literacy and Skills Survey (IALSS) measures the proficiencies in literacy (Prose – understanding and using information from texts and documents; Document – locating and using information in different formats), numeracy and problem solving of the Canadian population. The scores are reported on a continuum of 1 through 5. Level 3 performance is generally considered the benchmark because in developed countries, performance above Level 2 is generally associated with a number of positive outcomes such as increased civic participation, increased economic success and independence, and enhanced opportunities for lifelong learning and personal literacy. In 2003, according to the IALSS, just over half of Canadian adults scored over Level 3 performance in literacy (prose and document). Just under half scored over Level 3 performance in numeracy. Just over one-quarter scored over Level 3 performance in problem solving.